It's often said that God works in mysterious ways. And for those who believe in the afterlife, the thought that the late Steve Jobs may have been upstairs whispering into the ear of the big man isn't hard to imagine. After all, it's been a busy year for the South Koreans, from innovating to litigating - and finding $1bn down the back of the sofa to pay a fine to Apple. How things has changed since Samsung came onto the scene years ago with the dual-screen A300. Now, they're, debatably, the market leader in tech. Here, we take a look at their highs and lows of 2012. Love them, or hate them, there's no denying that 2012 has given us probably the best portfolio we've seen from Samsung. 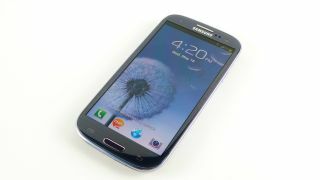 When the much-anticipated Galaxy S3 was announced earlier this year, it wasn't at CES or MWC like its peers. Such was the excitement around it, Samsung was able to hold its own event, taking a cue from arch-rival Apple, because it was so confident the crowds would come specifically to see what was on offer. The day of launch came and we were there to see the queue at the Samsung store in Stratford. It may not have been iPhone length, but it was pretty big. It's still at the top of our list as best phone. The punters agree – Samsung managed to ship 18 million of the things in the third quarter of this year. And don't get us started on the Note 2, which we reviewed and found to be one of the best devices out there. Even the Galaxy Note 10.1 tablet has managed to sell impressively – despite having a fairly lower-resolution screen than those we've grown accustomed to. Remember how Steve Jobs threatened to "go thermonuclear" on Android because he felt it was a stolen product? Well, as Samsung got bigger, Jobs' ire (and that of Apple after his demise) appeared to shift less from Google and more to Samsung. The legal toing and froing has made us dizzy and reminiscent of a game of ping-pong, with a £652m ($1.05bn) fine in place of the ball. But the sweetest part of Samsung's fight will have been the victory it scored in forcing Apple to publish an apology on its website. Not just tucked away anywhere as was originally the deal – but on the UK front page, no less. Ouch! And it's still there, for all to see as they head to Apple online to buy their Christmas presents. Double ouch! Nobody (even Cupertino) could accuse Samsung of not being innovative. Sure, a lot of things in Android (and TouchWiz) are similar to those found in iOS, and vice versa. Who invented them is a whole other story. But the newly launched Galaxy Camera has been a great creation. Again, Wi-Fi enabled cameras aren't new – but one running 3G and Android?! Now, that is cool. Remember, this isn't a phone with a great camera. It's a great camera with a phone added on. Or, at least, the phone functionality - without the calls bit. Naturally, it's more of a niche device – and it's hardly sleek or cheap - but the thought of being able to edit your phones on the go and even mix up a bit of Instagram action, then tweet or Facebook them, is truly marvellous. We're currently working on our detailed review – but early indications are that it's a belter.